Yes, Prescott has creeks, ten of them which flow through and nearby the City: Granite, Aspen, Willow, Manzanita, Miller, Butte, Banning, Spence, the North Fork of Granite, and Mint Creek. Some of them, like Granite Creek, flow year round. The resulting riparian areas make Prescott unique in the state of Arizona and a summer vacation destination for the entire West. Are you aware that trails exist within the City, which allow you to walk along the creek side and into Granite Creek Park? Have you hiked in Watson Woods, which surrounds Granite Creek as it flows into Watson Lake (the entrance is off Highway 89 at Rosser Street)? If not, you should explore these areas while the weather is still lovely, and discover at first-hand what makes Prescott so special. And while you are at it, discover Prescott Creeks, the organization, as well. It’s a non-profit created to enhance the quality of our local creeks and to preserve and restore our riparian habitat. The office is located in the historic log cabin buildings adjacent to Watson Woods, which was once a lush 1,000 acre riparian forest with mature walnut, cottonwood, willow and maple trees. It was reduced in the early 1900’s to a gravel pit and then a dump. Prescott Creeks, on contract with the City, has restored 126 acres to its former glory, providing a clean passage for water flowing into Watson Lake, a secure riparian habitat for its wildlife, and a unique hiking experience for the community. In 2015 Prescott Creeks celebrates the 25th anniversary of its founding. Stop into the office at the north-west corner of Highway 69 and Rosser Street for information on its programs, membership opportunities and maps to the City’s creek systems. Community involvement is a vital component of its charter, so consider signing up for volunteer services (recent activities included noxious weed removal and butterfly banding). Check out the website at www.prescottcreeks.org for information on upcoming events, current restoration and mitigation projects, introductions to the staff and board members, membership options, and invitations to events celebrating the 25th anniversary. Consider becoming a member as well. Water is a vital issue to the state and the community, and your time and your money cannot be better spent. 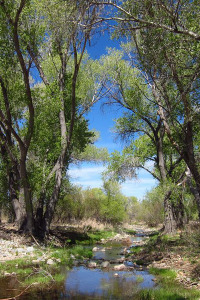 The Prescott Creeks mission statement: achieving healthy watersheds and clean waters in central Arizona for the benefit of people and wildlife through protection, restoration, education and advocacy. 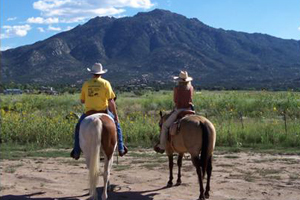 Prescott National Forest is building nine new miles of trail north of Granite Mountain, with the help of the Backcountry Horsemen of Central Arizona (BCHCAZ) and Arizona State Parks. 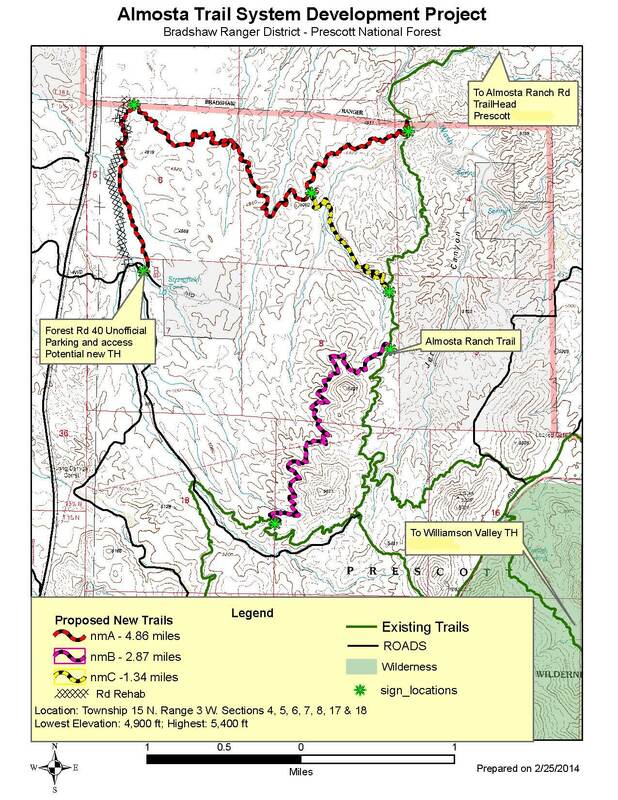 These new trail segments will connect existing trails in a manner that creates some new loop options within the Almosta Trail System. The trail is being built with a mini track “SWECO” machine for the rough layout, followed by hundreds of hours of BCHCAZ volunteer labor packing in water and supplies, lopping, clearing and finishing the surface. The new trail segments will be easily accessible off Williamson Valley Road via the Almosta Ranch Road trailhead (Almosta Trail #622) and the Williamson Valley trailhead (trail #671 and #1937, via trail #308). 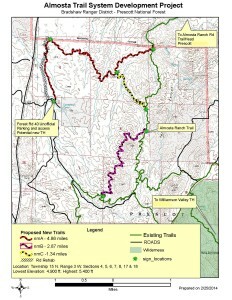 The map below will help visualize the “before” and “after” trails, and illustrate the new loops. by Curt WeaverHere is some background information on the Arizona Land Trust that may be helpful for those of you who want to venture off the beaten path. First of all, the Arizona State Trust Land is NOT public land hence the need for a “State Land Recreational Use Permit”. These permits can be obtained on line at the Arizona State Land Department ( https://land.az.gov ). Once there click on “Individual & Family Permits” and an application form will be downloaded. It costs $15.00 for an “individual” or $20.00 for a “family” permit. The application then needs to be submitted to the Arizona State Land Department 1616 W. Adams St. Attention: Public Records, Phoenix, AZ 85007. Applications are processed promptly and are in effect for one year.Such a permit opens 9.2 million acres of land for various uses including recreational. In Williamson Valley there are many land trust locations and with the appropriate recreation permit it would give one access for “… activities such as camping, hiking, horseback riding, picnicking, bicycling, photography, sightseeing and bird watching… Vehicles may travel only on existing roads and trails… Target shooting is not allowed on State Trust land.” While pursuing these activities a person may encounter “…windmills, stock tanks, corrals and other range improvements. 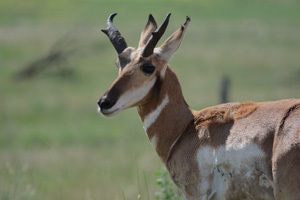 These are the property of the grazing lessee and vital to their livestock operation…” and need to be respected. Such a recreational permit offers an alternative to our traditional trail system as well as many new opportunities to view new areas and some old ones we thought we were familiar with. Have fun exploring!